Invisible Analysis: China offers no Surprise. 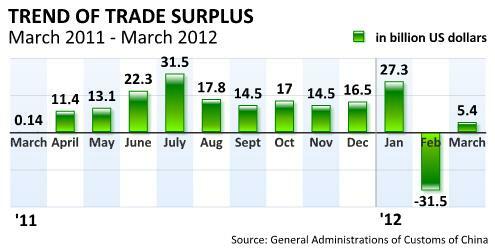 China reported last month trade deficit which was recorded after 20 years in the Chinese economy. The trade deficit of China was worth $31.5 billion in February, the largest since 1990.Today the latest figures came up where china has shocked the world economy with a trade surplus. China swung back to trade surplus in March from February's deficit of $31.48 billion, posting $670 million trade surplus in the first quarter according to the General Administration of Customs (GAC).Exports amounted to $165.66 billion in March, up 8.9 percent year-on-year, while imports reached $160.31 billion, the GAC data showed.The amount of foreign trade in china surged March by 7.1 % year-on-year to reach $325.97 billion, with a trade surplus of $5.35 billion. The trade surplus indicates money is flowing back to chinese streets again. Well it was not an surprising number for me as the last month number of trade deficit was backed the Chinese lunar New Year which fell in January this year, the year-on-year growth rates for Chinese exports and imports were distorted, and combined figures for the January-February period were could have better reflected the numbers of growth. Moreover china is being acclaimed that its economy is facing a hard landing. 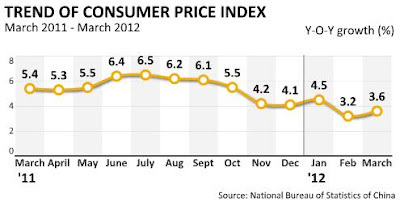 Well according to me Asian economies are facing the heat of high inflation and slow growth for the past 6 months or more. India,China and other Asian economies are facing the slowdown of the European market. From January to February, China's exports to the EU dropped by 1.1%, pulled down by the crisis in Italy, where imports from China fell by 31.1%.Further china has been able to swung into trade surplus due to China replacing European countries from exporting countries map. China despite of the hurdles in European economy has exploded emerging markets which helped Chinese exports. Sales to Russia and Brazil gained 10.3% and 10.9%, respectively. 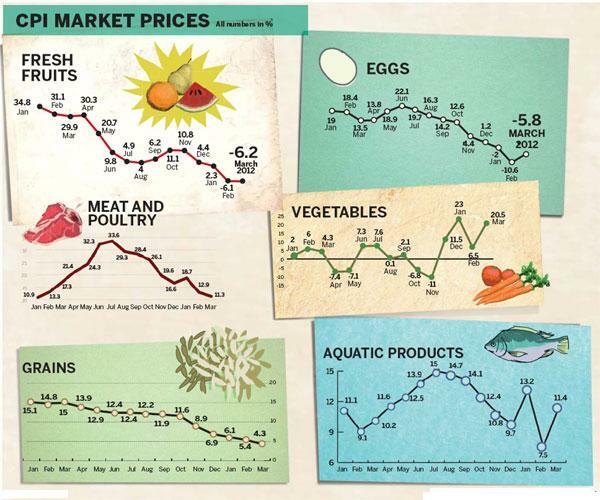 High Inflation Replacing Export short fall. China is facing the heat of high inflation which has spooked up the price of living in China. This sudden abnormal price hike in living cost is made to adjust the shortfall in export income for the Chinese companies who are heavily dependent on export. In simple words inflation is china is small time frame matter and will last till it finds its domestic demand and export markets to strengthen back its low cost living back bone. Rising prices in china has impacted the low income families are grappling with the food cost which surged by 7.5% which spooked the CPI to 3.6% year-on-year in March, according to the National Bureau of Statistics.CPI went up since food prices accounts for nearly one-third of the weighting in the calculation of China's CPI. China Real Estate Offers no Tension. China has being more keenly watched about its policies for the real estate market. China is not going to change any polices related to boost up the real estate market unless China finds the price proportion to income of buyers coming down. It has been found in research that many developed countries indicates that reasonable home prices are usually three to six times a yearly household income. The ratio in some of China's first-tier cities, such as Beijing, Shanghai and Shenzhen, however, has reached more than 15 and even 20 times yearly incomes. This simply means prices will come down by 50 to 60% in order to relax norms for Chinese government for the real estate market. Despite of restriction on the Chinese real estate market China has found substantial growth in the property market. In the first 10 days of March, the sales area of newly built commercial houses in Shanghai reached 417,000 square meters, an increase of 165.6% on the same period in February. There was also substantial demand of second hand home sales. Developers have made efforts to boost sales, by reducing or even waiving down-payments and offering big discounts. Even the China's central bank, recently changed its structure of housing loan, that commercial banks should guarantee lending to first-time home buyers and ensure they enjoy a differentiated preferential interest rate. This further has spooked the demand in Chinese property market. In fact, some banks in Beijing has already began offering the benchmark interest rate to homebuyers instead of the higher rates adopted from the start of this year. China has shifted to affordable housing segment and hence growth will come from only affordable housing segment and not from the large sized historic sales deal which used to be heard in the past decade. China is going to achieve growth from its domestic middle income population and not from the cash rich segment. India also adopted similar stances but its big question of how much success has been achieved in affordable housing market in India. For china land-sale revenues are a large contributor to local fiscal coffers and hence there is less chances of major price correction over the period of time followed with smaller declines compared to Indian economic culture. In my research I have drilled further and found that with the rise of property prices over the past decade, the proportion of land sales income to local fiscal revenues has increased from 16.6% in 2001 to 48.9% in 2009.Hence any chances of price decline in Chinese real estate market is an question of big doubt. Over and above china should not be taken as a looser economy. It has outshined most of the economies through its policies and it will continue its journey of economic growth of 9% depending upon the domestic driven demand replacing the export market. This transition is ought to bring volatility and slow down for the Chinese economy. Great post! I am so impressed by the info that you've in this website. Your information is most informative for us. Thanks a lot. Good luck. PHARMA NEEDS PE & IB FOCUS.